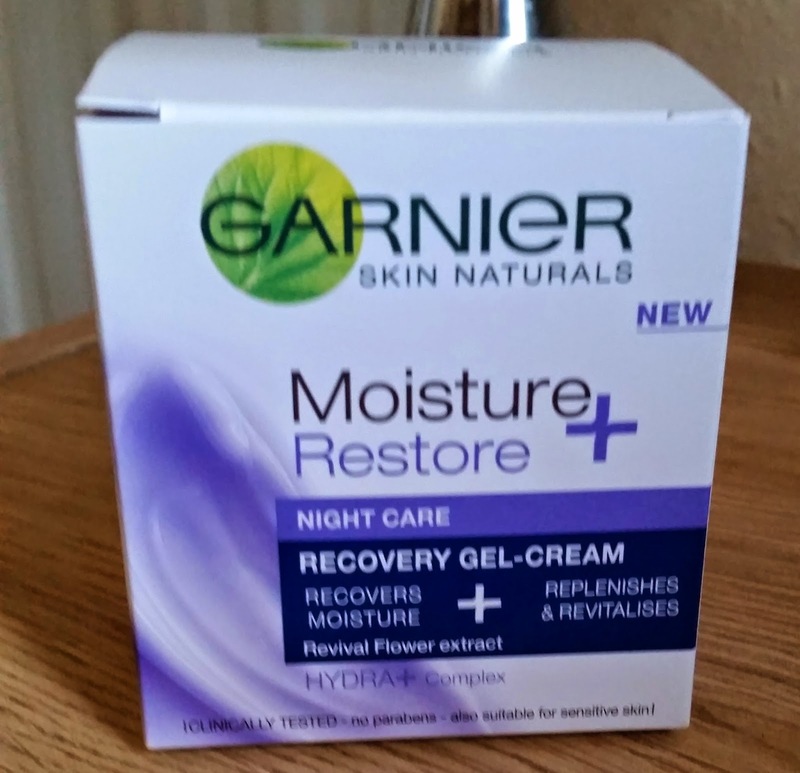 I spotted this, being that i have been using Garnier products quite a lot recently (see my other review) that this was a new product i hadn't spotted before. When i picked this off the shelf i saw on one side that it said BEAUTY SLEEP on the side of the box, We all need some beauty sleep now and then. What grabbed my attention was the word RECOVERY. Our skin goes through life's stresses now and then so this spoke volumes to me! 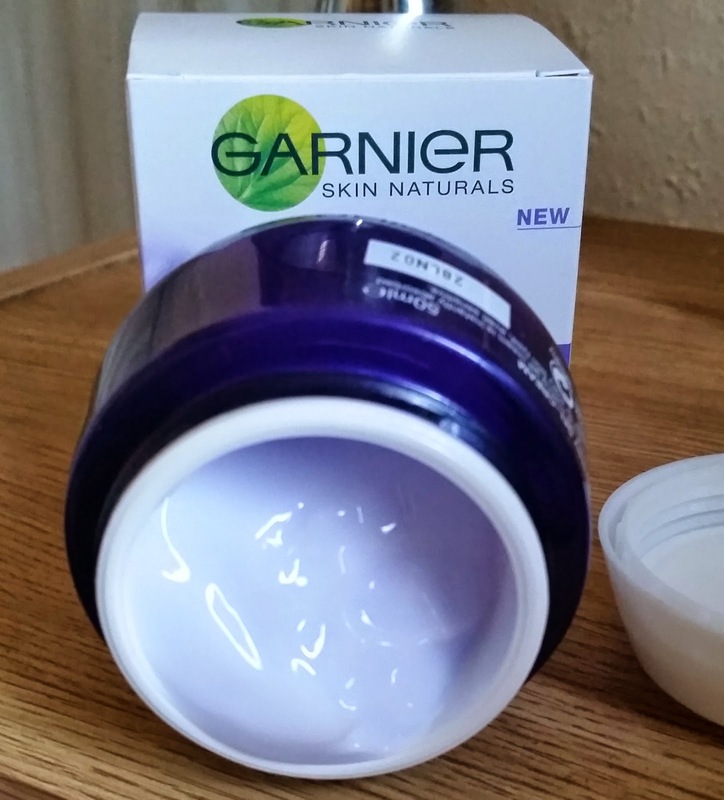 I quickly looked at the back of the box, as this is what i like about Garnier's products, they tell you exactly what its going to do and if it is suited for you. Not like when you buy a product and there's nothing on the packaging to tell you if its suited for you, so u approach the till to pay. Saying a little prayer you wont be out of pocket with a product that's not going to work for you. 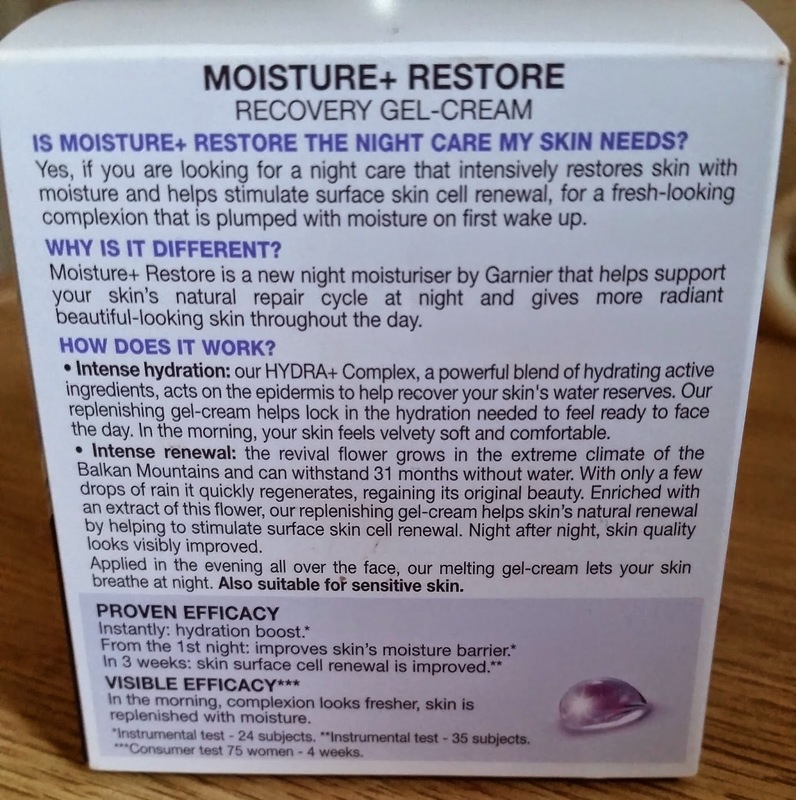 IS MOISTURE + RESTORE THE NIGHT CARE MY SKIN NEEDS.... yes, if you are looking for a night care that intensively restores skin with moisture and helps stimulate surface skin renewal , for a fresh-looking complexion that is plumped with moisture on the first wake up. WHY IS IT DIFFERENT?..... 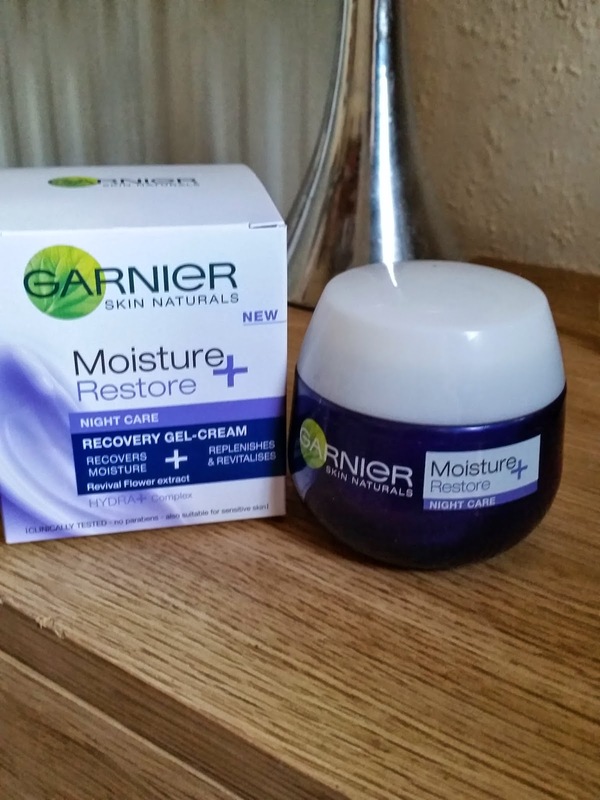 moisture restore is a new night moisturiser by garnier that helps support your skin's natural repair cycle at night and gives more radiant beautiful-looking skin throughout the day. HOW DOES IT WORK?..... INTENSE HYDRATION our HYDRA+COMPLEX, a powerful blend of hydrating active ingredients acts on the epidermis to help recover your skins natural water reserves. Our replenishing gel-cream helps lock in hydration needed to feel ready to face the day. In the morning, your skin feels velvety soft and comfortable. INTENSE RENEWAL.... The revival flower grows in the extreme climate of the Balkan mountains and can withstand 31 months without water. With only a few drops of rain it quickly regenerates, regaining its original beauty. Enriched with an extract of flower, our replenishing gel-cream helps skins natural renewal by helping to stimulate skin cell renewal. night after night, skin quality looks visibly improved. Applied in the evening all over the face, our melting gel-cream lets your skin breathe at night . Also suitable for sensitive skin. 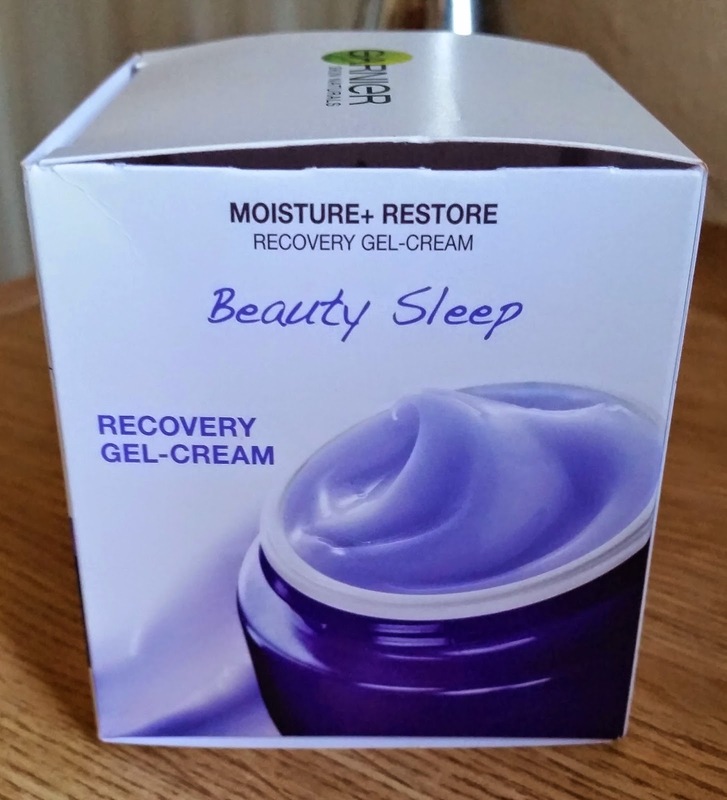 Also the gel-cream is is a pale blue colour which makes a change from the just white moisturisers. I was surprised as this feels so soft and also when applied to the face does glide on. Doesn't feel sticky at all and absorbs into the skin well. It felt so refreshing to the skin and didn't feel heavy, allowing my skin to definitely breathe! Best of all, the next morning my skin did look refreshed and renewed! I had no reaction to this and this hasn't broke me out! This retails for £3.99 and for 50ml that is quite good value as your not breaking the bank.